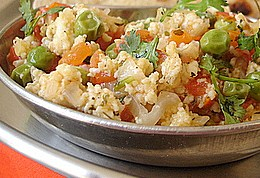 An Usual Burji with vegetables not only have a different taste but also nutritious too! In one bowl beat the eggs & keep it aside. Heat a pan with oil, let the cumin-mustard seeds splutter, further add ginger-garlic paste & then onion. When onion become golden brown colored, add tomato, cook them for 3 min. Now add salt, turmeric & chilly powder, then peas & other vegetables. mix them properly & finally add beaten eggs. Cook it like a regular burji, then add coriander leaves,sprinkle lemon juice,mix it.remove from fire & serve.